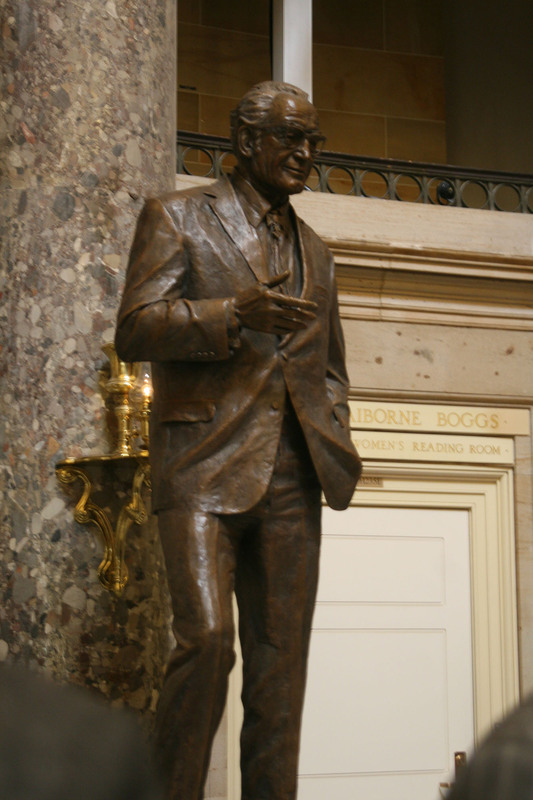 WASHINGTON – Barry Goldwater is back in the U.S. Capitol – but this time he’s 8 feet tall and bronze. 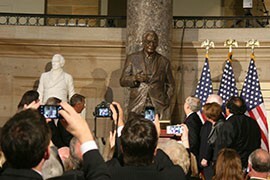 A 1,700-pound statue of the former Arizona senator and one-time Republican presidential nominee was unveiled Wednesday in Statuary Hall before a tightly packed crowd of family, friends and politicians – most of whom wielded cameras at some point during the half-hour program. “He was the father of conservatives and brought that message full circle today,” said Rep. Paul Gosar, R-Prescott. But even Democratic leaders were on hand to remember the man who was considered an arch-conservative by many. House Minority Leader Nancy Pelosi reminded the crowd that Goldwater was more than just Mr. Conservative: His support of gay equality and women’s reproductive rights was fairly new and relatively unpopular in his time, she said. The large crowd included some who knew Goldwater and some who only know his legacy, and featured House Speaker John Boehner and Senate Majority Leader Mitch McConnell. Every state is allowed two statues in the Capitol and Wednesday’s unveiling caps a multiyear effort by supporters to make Goldwater one of Arizona’s statues, along with Father Eusebio Kino. A statue of Arizona industrialist John Greenway, which had been in the Capitol for 85 years, was removed to make way for Goldwater and is heading back to Arizona to be displayed in the State Capitol. But all the talk Wednesday circled around Goldwater. Attendees worked the room before the unveiling began, shaking hands and catching up with those they knew while introducing themselves to those they didn’t, like the state and national politicians that many of them were. But even as he was remembered for his legacy to the Republican Party, speakers also cited Goldwater’s ability to maintain good relationships with leaders like John F. Kennedy, even when they disagreed politically. Rep. David Schweikert, R-Fountain Hills, said that when he was young his parents were family friends with Goldwater, but it was not until he was older that he understood the magnitude of the man and his impact on politics. He said the world should remember Goldwater as someone who didn’t give up his belief in freedom even when it wasn’t a popular idea that would get him votes. “The world caught up to him, instead of him chasing what was popular,” Schweikert said. They came from both sides of the aisle and both sides of the Capitol to praise the man alternately known as Mr. Arizona and Mr. Conservative. Cronkite News reporter Nihal Krishan is in Washington for the unveiling for former Arizona Sen. Barry Goldwater's statue in the U.S. Capitol. 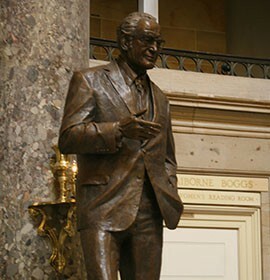 A statue of former Arizona Sen. Barry Goldwater, a one-time presidential nominee, takes its place in the U.S. Capitol, where Goldwater served 30 years.